I found some more time this week to tie a few Takayama Sakasa Kebaris with floss bodies. I like how the floss shines and shimmers under water and hopefully our finned friends will like that too. Also, I now prefer to tie them off with wire at the hook bend; I think that gives them a nice little touch. This batch of flies will go out today or Monday to a special friend as a surprise. I will post them later to the Fly Box page with the complete recipe. Tight Lines and go get out there! Today I got mail. Yes, we all receive mail each day. Most of the time it's just crap invoices, bills and credit card offers. What I got in the mail today is truly special though. Some of you might already be familiar with Joel DeJong's blog A Year On The Fly. He's the very talented artist and fellow Tenkara angler who recently painted a picture of my Yellow Bee Sakasa Kebari which now is the header of this blog. 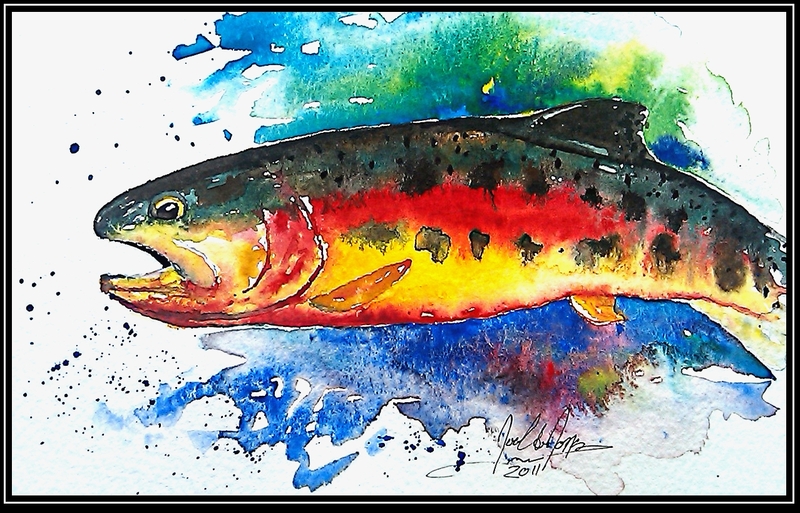 Joel painted a picture of a Golden Trout and posted it on his blog for a "thank you" contest. Anybody leaving a comment would be entered in the drawing for this painting. And yes, I was the lucky winner! I am now the proud owner of two originals or Joel's work and I am thinking of maybe adding some more soon. Please visit Joel's blog and web site and add him to your blog roll. I am sure you will enjoy it as much as I do. It seems that this "Tenkara thing" is indeed taking off not just here in the States, but globally. Most of my visitors are from the US but there are visitors from the UK, Canada, Australia, France, Sweden, Switzerland (! ), Italy, Russia, Germany, Poland, Czech Republic (! ), Hungary, the Netherlands, Finland, South Africa and the list goes on. I will strive to continue to provide the same level of content; focusing on my own experience, fly tying and other noteworthy items from the Tenkara and fly fishing community. Should you have anything that you would want me to post about, please let me know. Thanks for being a reader and follower.